The Mareva (Petit Corona) is my favorite vitola. Of all the cigars I smoke, odds are that it will be a mareva 75% of the time. I smoke marevas most often due to their availability among most brands, the time to smoke (45 min to 1 hour), their balance of ring gauge and length–which allows the blender to fully express the balance of seco, volado, and ligero–and the way they feel in the hand. Balanced, perfect. My ultimate cigar, I have a leisurely couple hours and want something extra special, is a Prominente (Double Corona), which I believe is the finest expression of the cigar maker’s art. 49 x 7 5/8 inches of gustatory and sensory pleasure. But leisure time like that is a little hard to come by and that’s why a mareva fits the bill so nicely most of the time. 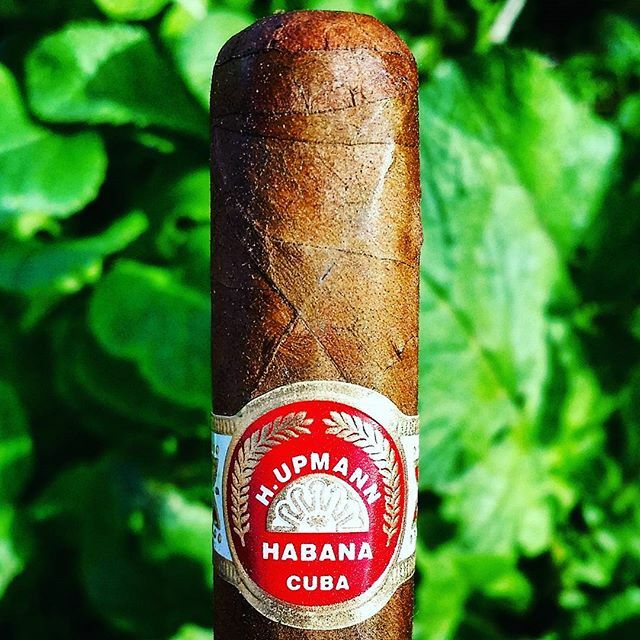 I am a real fan of the H. Upmann Petit Corona. Aethetically, I really like the deep red color of the band against the gold and white detailing. In the case of the Petit Corona, which is a boxed pressed and semi-rustic looking cigar, it really stands out. It seems to give it authority. This particular one is a right-in-the-middle colorado tone, with a characteristic looking slightly veined wrapper and a nice, even box pressing. The aroma before lighting is animal. It smells faintly of deerskin–the kind that is dried in the sun (not chemically processed) and has been around long enough that it looses that decomposed smell, but retains its gamey quality. It also smells of musk and the inside of a cedar cabinet–an old one. The wrapper is not excessively oily–it actually feels a bit chalky in the mouth, but moistens nicely with a few rotations in the lips. The draw is perfect and it starts out well. As I get further in to it, maybe a third of an inch, the evolution of flavors goes from animal and musk to toasted levain bread (it has that whole wheat / browned crust thing going on) with an undertone of leather. The burn is going well. Throughout, the flavor is pretty linear so far. It does not go off on an improvisational riff–it stays with the same melody. A subtle inhale of the smoke as it passes my nose reveals more of that hint-of-deerskin–that makes sense–it smelled like that before lighting. This is also one of those cigars that really has a distinct blue cast to the smoke–I wonder all the time what causes some cigars to exhibit this more than others. Maybe its just the quality of the light outside–it is overcast but the sun still feels intense. That might have something to do with it. The wrapper on this one is splitting a little bit 2/3 in to the cigar–a minor bummer but the burn is still even, and the flavor is great. Consistent. Absolutely no excessive concentration of flavors–no prickle on the tongue. Through to the end, this was a fun one–really satisfying–and at this age, starting to come in to its own.